Plantar fasciitis impacts over three million people in the United States every year. This is when your fascia, which is a thick, fibrous band of tissues that stretch from your heel to your toes, is overly stretched, resulting in tiny tears in the surface. It causes inflammation and intense pain and sufferers are so bad that they’re sometimes forced to limp around or not move around at all. That’s not the type of life that anyone wants to live. Often, a doctor’s first advice for curing plantar fasciitis is to choose supportive shoes and avoid wearing thin or worn out shoes. Unfortunately, many people with plantar fasciitis think this rules out sandals and flip flops. But, just because you’re suffering from plantar fasciitis, doesn’t mean that you need to give up on sandals and flip flops all together and resign yourself to a life of being trapped in sneakers. In reality, there are sandals on the market that are specifically designed for people with plantar fasciitis. Sandals don’t normally have the same support and security that shoes offer, but sometimes you just need to wear them. However, if you suffer from plantar fasciitis, you might not know what to look for in a pair of sandals. First and foremost, you want to ensure that the sandals you choose have arch support to help your plantar fasciitis. In addition, you will want a deep heel cup to provide some added motion stability and a snug foot strap to keep your foot secure and prevent it from sliding around. In addition, you also want to choose a sandal that is comfortable and functional. You might gravitate towards sandals that are stylish and fashionable, but the main focus should really be on your foot health. Now that you know what to look for in sandals for plantar fasciitis, it’s time to take a deeper look into some of the top sandals for plantar fasciitis on the market. Birkenstock is well known for their comfortable and high quality sandals and the Birkenstock Unisex Arizona Essentials EVA Sandals are no exception. Coming in a wide variety of colors from neutral tones to pink and blue, the Birkenstock Unisex Arizona Essentials EVA Sandals are priced very affordably, which makes them even more appealing. Modeled on the traditional Birkenstock cork sandal, the Birkenstock Unisex Arizona Essentials EVA Sandals are made from flexible and lightweight EVA. In addition, the Birkenstock Unisex Arizona Essentials EVA Sandals are also odor-neutral, waterproof, and washable so you get a plethora of benefits. 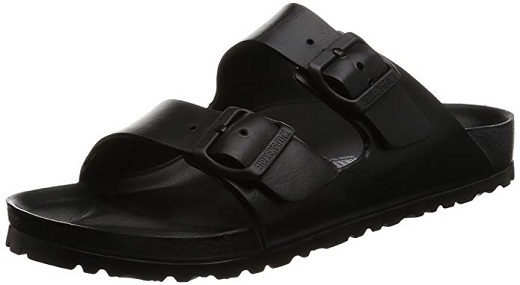 As far as being sandals for plantar fasciitis, the Birkenstock Unisex Arizona Essentials EVA Sandals come with an anatomically shaped Birkenstock foot bed that is designed to hug your feet and provide quality arch support. With this foot bed, it doesn’t matter if you’re standing for hours, you’ll still be comfortable and pain-free in your feet and lower legs. For great sandals for plantar fasciitis from a reputable brand, the Birkenstock Unisex Arizona Essentials EVA Sandals are a great choice. For unfussy design and undeniable comfort, the Vionic Unisex Wave Toe Post Sandal is one to consider on your hunt for the best sandals for plantar fasciitis. These sandals are great because they come in a variety of different colors so you can choose one—or all three!—that fits your preferences best. In addition, the Vionic Unisex Wave Toe Post Sandal is designed to absorb shock and provide long lasting comfort all day long. The sandals also come with exemplary arch support and this is essential for those suffering from plantar fasciitis. The soft nylon webbing and biomechanically designed foot bed offers serious comfort that is hard to find in other sandals for plantar fasciitis. The Orthaheel Technology is also featured to hug your arches and offer unparalleled support. They’re also lightweight and stress reducing. Plus, the Vionic Unisex Wave Toe Post Sandal is extremely easy to clean and care for by simply wiping it with a damp cloth. For a great pair of flip flips of plantar fasciitis, check out what the Vionic Unisex Wave Toe Post Sandal has to offer. With the OOFOS Unisex Ooahh Slide Sandal, you don’t have to give up wearing sandals just because you have plantar fasciitis. In fact, the OOFOS Unisex Ooahh Slide Sandal is so supportive and comfortable that it’s one of the best recovery footwear options on the market. These sandals are lightweight and have a squishy feel that’s comfortable while still being supportive. Plus, they feature tremendous arch support to keep your foot supported. The closed-cell foam cushioning is also extremely comfortable and can keep your feet rejuvenated even for extended periods of time. In addition, they’re also water-resistant so that’s great for people with sweaty feet. What makes the OOFOS Unisex Ooahh Slide Sandal so great is that the patented technology absorbs 37% more weight than other foam foot beds so there is less impact radiating up through your body. These sandals are great for people will all types of feet, wide, flat, bunions, and then some. If you are looking for great unisex sandals for plantar fasciitis, the OOFOS Unisex Ooahh Slide Sandal is one to consider. Another great unisex option for sandals for plantar fasciitis is the Telic Flip Flop Sandal Shoes. These sandals mirror typical flip flops, which might be something you never thought you’d wear again due to your lingering foot pains. The great thing about the Telic Flip Flop Sandal Shoes is that they come in a wide variety of colors so you can choose the one that suits you best. These flip flops are great for those with plantar fasciitis because they contour to your feet to provide more support. In addition, the Telic Flip Flop Sandal Shoes also have strong arch support, which is essential for those with plantar fasciitis. Plus, it has a deep heel cup to keep with foot motion and a slight heel rocker. The textured foot bed is also designed to offer shock absorption while also providing a gentle massaging effect. Telic is a reputable brand name and if you are looking for a great pair of flip flops for plantar fasciitis, be sure to check out the Telic Flip Flop Sandal Shoes. For the top men’s sandals for plantar fasciitis, the Drew Shoe Men’s Warren Sandals are a great pair to consider. With the Drew Shoe Men’s Warren Sandals, you don’t have to give up on sandals just because you have plantar fasciitis, especially because these sandals are lightweight with the arch support you need. They also come with a removable-cushioned foot bed for easy cleaning, replacement when the time comes, or the insertion of custom orthotics. Plus, the Drew Shoe Men’s Warren Sandals also have a flexible and shock absorbing outsole rubber outsole that offers comfort, support, and good traction. 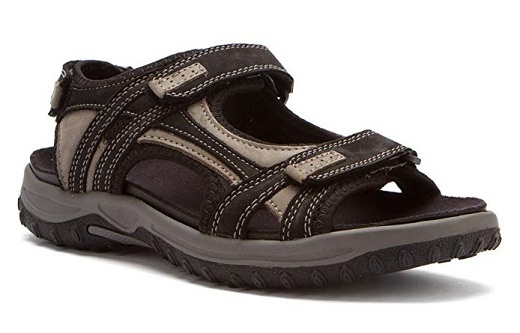 In addition to everything listed above, the Drew Shoe Men’s Warren Sandals also feature three adjustable straps with hook and loop closures so you can get a snug and secure foot. The nubuck upper is another feature that other sandals for plantar fasciitis lack. Simply put, if you want the best sandals for plantar fasciitis, you need to take a look at what the Drew Shoe Men’s Warren Sandals have to offer. For another great pair of sandals for plantar fasciitis, you should also consider the Orthofeet Proven Pain Relief Plantar Fasciitis Orthopedic Comfortable Diabetic Flat Feet Naples Sandal. These sandals are specifically designed to provide a customized fit for your feet and they are truly comfortable. With an adjustable heel strap and upper tie-less fastening system, you can rest assured that your feet will be snug and secure even in sandals! In addition, the Orthofeet Proven Pain Relief Plantar Fasciitis Orthopedic Comfortable Diabetic Flat Feet Naples Sandal also comes with a lined, soft passing that offers more cushion for those with feet pain. The ergonomic sole softens your step and helps propel your feet forward, while the cushioned insole absorbs the shock to reduce stress on your feet and joints. The stretchable uppers also ensure that there is no pinching or pain while wearing the sandals and the arch support is perfect for those with plantar fasciitis. For a great pair of sandals for plantar fasciitis, the Orthofeet Proven Pain Relief Plantar Fasciitis Orthopedic Comfortable Diabetic Flat Feet Naples Sandal clearly jet towards the top of the list. 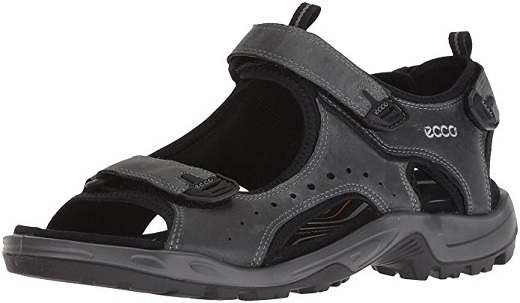 For something a bit different, closed-toe sandals for plantar fasciitis, the KEEN Men’s Newport H2 Sandal is worth a look. These come with a larger toe box for more comfort and feature extremely grippy outsoles that offer great traction. Plus, they are made from quick drying materials so they are great for watersports, hikers, and beach goers as well. Plus, they provide more flexibility and breathability than a normal hiking shoe so you might even be more comfortable. The KEEN Men’s Newport H2 Sandal has a firm, but lightweight design that makes it built for anything. The upper contains neoprene backing so there is cushion at every point of cushion and the arch support necessary for those with plantar fasciitis. They are priced a bit higher than some other sandals but keep in mind you should compare that to the cost of hiking and water shoes, not your run of the mill flip flops. For quality water sport or hiking sandals for someone with plantar fasciitis, the KEEN Men’s Newport H2 is a sandal to consider. 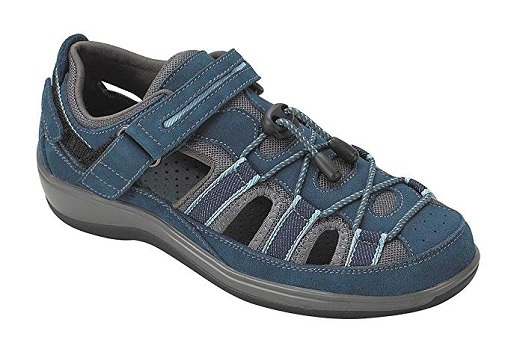 Another option for a trail or walking sandal for someone with plantar fasciitis is the ECCO Men’s Yucatan Sandal. This sandal comes in a variety of sizes with half sizes available and fit as expected. They are made from leather and fabric and are lightweight, which is great for walkers and hikers. While they are not waterproof, they do typically dry quickly. In addition, the ECCO Men’s Yucatan Sandal features a PU midsole with Receptor Technology to absorb shock and reduce the stress on your joints. With a rubber outsole to provide good traction and a comfortable design, these are some of the best sandals on the market. Plus, the ECCO Men’s Yucatan Sandal is built to last so your investment won’t be short lived. You can expect them to last at least a few years, which is almost unheard of in today’s consumer market place. For long lasting and comfortable sandals for plantar fasciitis that can hold up on the trail, check out the ECCO Men’s Yucatan Sandal. Women’s feet are different for men and sometimes you need a sandal for plantar fasciitis that is specifically designed with a woman’s foot in mind. These four sandals are the best Women’s sandals you can get for Plantar fasciitis these days! For a woman who is always on her feet but does not want to sacrifice wearing sandals just because she suffers from plantar fasciitis, the Taos Women’s Trulie Wedge Sandal might be the answer she is looking for. 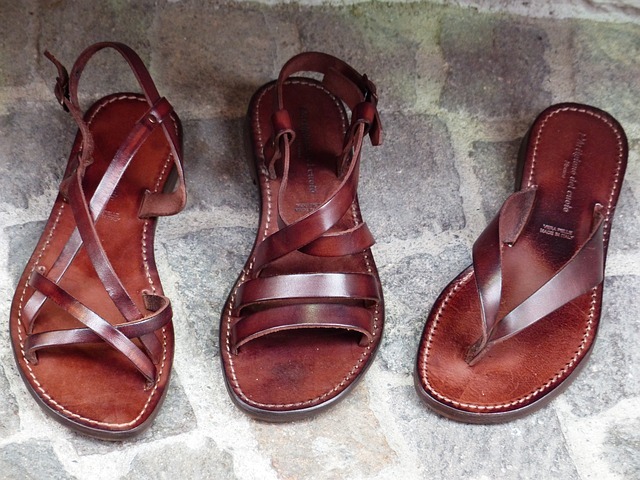 These stylish sandals come in a few different colors so they can be worn with any outfit! Plus, the 1 ¾” heel offers just a little lift while providing relief to rough plantar fasciitis pain. The arch support isn’t as aggressive as some other models, but it still gets the job done. Plus, the polyurethane cork foot bed is both light weight and shock absorbing. That’s essential for reducing pain associated with plantar fasciitis. Topped with premium padding, you can rest assured that your feet have the cushion and support necessary to remain comfortable. 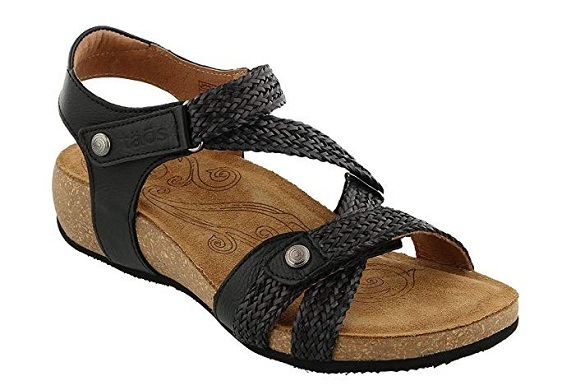 The truly great thing about the Taos Women’s Trulie Wedge Sandal is that it doesn’t have the look of a sandal for plantar fasciitis so you won’t need to be self-conscious about walking around in a clunky, bulky sandal. For stylish sandals that help with plantar fasciitis, the Taos Women’s Trulie Wedge Sandal is one to consider. Another option for women’s sandals for plantar fasciitis is the Dansko Women’s Sophie Sandal. This sandal is suitable for work and play and while it’s not as stylish as the Taos Trulie, they are certainly better than some of the other options on the market. The great thing about the Dansko Women’s Sophie Sandal is that it is a slide sandal so it’s easy to slip on and off. Plus, the leather upper comes with an additional buckle to ensure that you are getting a snug and secure fit. This is essential for people with plantar fasciitis. In addition, the Dansko Women’s Sophie Sandal also comes with a Dri-lex lining that wicks away moisture. This is designed to keep your feet dry, and in turn, more comfortable. 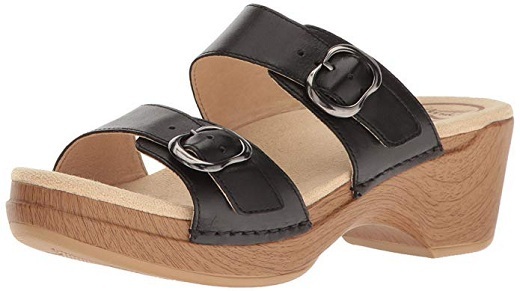 The Dansko Women’s Sophie Sandal also has a foam-cushioned midsole that provides some shock absorbing properties to reduce strain on your feet and joints. The durable PU outsole also provides the stability and traction you need to stay right on your feet. If you are looking for a versatile pair of women’s sandals for plantar fasciitis, the Dansko Women’s Sophie Sandal should certainly be on the short list of options to consider. The Keen Women’s Whisper Sandal is another option to consider for those with plantar fasciitis. This lightweight performance sandal offers not only a variety of color options but also a snug and secure fit through the secure fit lace capture system With natural odor control and a washable upper that makes it easy to clean, you’ll be hard pressed to find other sandals that top the Keen Women’s Whisper Sandal. 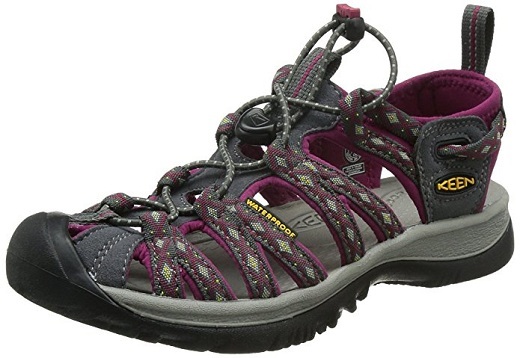 In addition to everything listed above, the Keen Women’s Whisper Sandal also comes with a cushioned foot bed that not only provides the arch support you need but also offers shock absorbing properties. The TPU stability shank also offers more support. What’s great about the Whisper Sandal is that comes with a women specific fit. If you want a high quality woman specific sandal for your plantar fasciitis, look no further than the Keen Women’s Whisper Sandal. Another option for those looking for sandals for plantar fasciitis is the Mephisto Women’s Helen Thong Sandals. The sandals are a take on your typical thong sandals but also feature a strap with an adjustable buckle so you can get a more secure fit. Plus, they come in a variety of colors so you can take your pick! The Mephisto Women’s Helen Thong Sandals come in leather, nubuck and patent uppers that are comfortable and prevent any chaffing. In addition, the Mephisto Women’s Helen Thong Sandals are also extremely comfortable. The cork foot bed is lined with leather that forms to your feet so you get both adequate arch support and comfort with the Mephisto Women’s Helen Thong Sandals. Plus, they’re breathable and durable, featuring a rubber outsole that also offers good traction. For a pair of sandals great for those with plantar fasciitis, the Mephisto Women’s Helen Thong Sandals are worth a look. Now that you have a better idea of what to look for in the top sandals for plantar fasciitis and what some of the best options on the market are, it’s time to start your purchasing process. Just be sure that you search for a sandal with great arch support that is comfortable and will keep your foot secure. Your foot health is important and these sandals for plantar fasciitis will help ensure that you keep your feet happy and healthy!